How do I choose a different method of payment? How do I edit a patient's chart? Editing a patient's demographic information or selecting an alternate method of payment for the patient can be done prior to vaccination or after vaccination, up until 7 p.m. EST of the current business day. Of course, we always recommend getting the patient to green prior to administering their vaccine, because you just don't know if the patient is going to provide viable information after the vaccine is irrevocably in their arm. That said, you can make changes post-check-out if needed. To edit a patient's chart, or to select a different method of payment, simply click on the patient's name in the Scheduler to open the patient pop-up window. Then, simply change any of the fields you wish to update and select "Save" at the bottom of the window. To add a patient's family member who has similar demographic information, select "Save & Add Family Member" at the bottom of the window. Choosing a different payment method. The Scheduler offers 3 methods of payment, depending on the patient's unique situation. Insurance Pay: This is the default method of payment on patient check-in and means that VaxCare will bill for both the CPT on the vaccine and the CPT on the administration of that vaccine. This also means, by nature, that your office does not bill for any portion of the patient's vaccines. You do not have to choose Insurance Pay if you plan to have VaxCare bill for the vaccines. This is always the default. 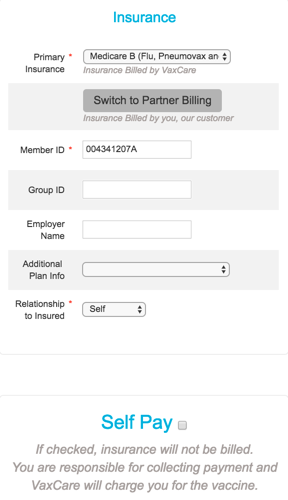 The insurance drop-down box for your Portal will only show the in-network payers for your specific state. Please keep in mind that your patient's insurance company might fall under a grouping of plans, like Multiplan or Center Care. Please be sure to check under these multi-payer plans before Partner Billing. Partner Bill: Partner Bill means that you, as our partner, have elected to bill for your patient's vaccine(s) for this encounter. When you Partner Bill, your office will bill for both the CPT on the vaccine and the CPT on the administration, then VaxCare will deduct the base cost of that vaccine from your next compensation check, according to our current Vaccine Fee list. To Partner Bill for the patient's vaccines, simply choose "Switch to Partner Bill" on the Scheduler. The system will ask for the primary insurance, but we will not bill. For reasons why your office might choose to Partner Bill as a first choice, see Methods of Payment (for Patients) in the Help Center. Self Pay: Self Pay means the patient pays your office directly, at the time of service, at whatever rate you choose. To select Self Pay, simply check the box for Self Pay at the bottom of the third column on the patient pop-up window. For more information, see Setting Self Pay Rates.